Today I welcome Karen Tyrrell on the first stop in her STOP the Bully tour. Karen is an Aussie author who cares passionately about mental health and family well-being. STOP the Bully is a lively, well-paced story for mid-grade readers. Best of all, it's not only an "issues" book. The characters are people we come to care about. To prepare for Karen's virtual visit, I asked her some questions about Stop the Bully. Q. Brian is a somewhat unusual name for a 21st Century child. How did you come to choose it for your main character? A. Brian is an old fashioned kid with old fashioned morals. I named him Brian from the very inception and it just stuck. Q. There’s an interesting twist in the book. I won’t give it away, but here’s a question; did you begin with the twist in mind or did it come up later? A. The twist idea and the ending came first for me. Then I wrote the story backwards, giving clues to the mystery, making sure the twist would only be revealed in the final chapter. Q. STOP the Bully has an arresting and powerful cover design. (See below.) Could you tell us a bit about that? A. I wanted a cover to be provocative, eye-catching and a tiny bit controversial. So, the teacher or parent would ask the class, what do you think the story is about? Are the characters assertive or aggressive? In reality, the cover depicts two different scenes where Amelia in one scene and Brian in another, save a bullying victim from the bully. Q. STOP the Bully seems to me to be an excellent book for classroom read-aloud. Is that the way you envisage it being used, or is it more of a novel that just happens to have this particular subject matter? A. YES, I envisage teachers reading a chapter or two each day leaving the kids wanting to hear more. (Fingers crossed). I would love children to be hooked in until the very end when Brian’s story is solved and resolved. STOP the Bully is perfect for spring-boarding discussions on bullying strategies and resilience. Thanks Karen! Read on for more on this brand new book. Want to follow the tour for a chance to win a prize? 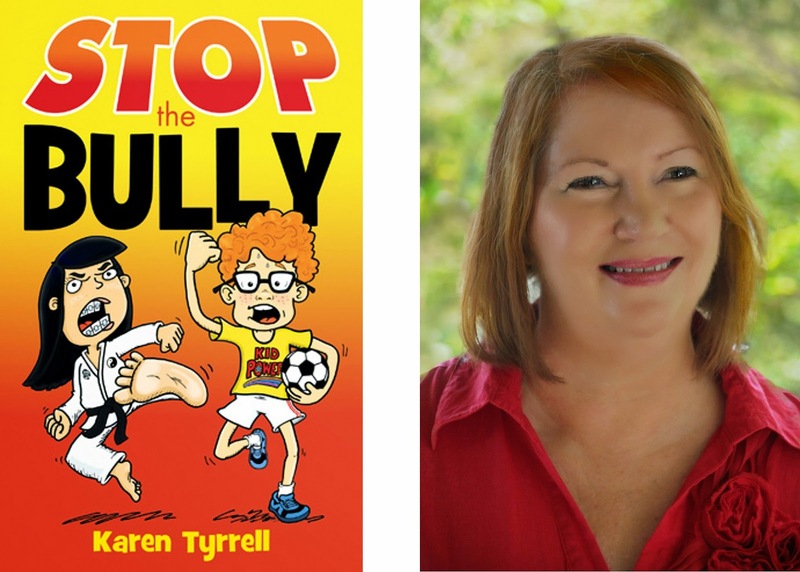 WIN: Signed copies and eCopies of STOP the Bully. Thanks for being my brilliant editor and being fist HOP on STOP the Bully Blog HOP. Congrats Karen for tackling another important topic in what sounds fun way. Thanks for the interview Sally and Karen. Thanks for the supportive comment. There are Fun elements, humour and mystery throughout the story to be appealing to children. It's not often an "issue" book has a really masterful twist. This one does! Great questions, Sally. Stop the Bully looks like a terrific book, Karen. Congratulations. well done Karen, we can all do with a little help to Stop the bullying and build resilient kids. for leaving your 4th comment on my Blog Tour. I appreciate what you are doing Karen. I too have a bully book that is coming out in July. Ty the Bull. Tackles the difficult issues of bullies and divorce. You are going to make a difference in children's lives. That is a wonderful thing. PS Good luck with Ty the bull.